During this tour you will visit two beautiful palaces in the suburbs of Saint-Petersburg. 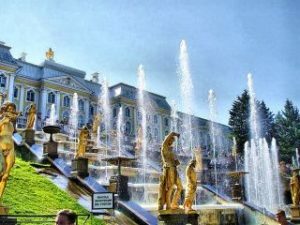 Peterhof Grand Palace and Park are located to the south from the city. The complex was built by the order of Peter the Great, to be the official summer residence of the Romanov’s family. The picturesque Lower park counts 114 various fountains ans 3 large cascades. Peterhof is usually compared by it’s beauty and luxury to the Versailes Palace in France. Catherine’s Palace is located in the town of Pushkin, formerly known as Tsarskoe Selo. It was started in 1717 as a small residence during the reign of the Empress Catherine I, but has got it’s final shape almost 40 years later, by the order of the Empress Elizaveta Petrovna. The palace interiors host the world famous Amber room (Amber Chamber), that was completely restored to it’s historical look.